With innovation and cost savings in mind, DNV GL developed a solution for remote surveillance service for subsea equipment manufacturing. The primary goal of this new alternative was based on cost savings; improved safety for surveyors; increased flexibility on testing schedules; availability of experts; and transparency for all stakeholders. "Remote witnessing is a part of other DNV GL operations. With this in mind, it was logical that we look at how remote witnessing can improve both on- and offshore subsea verification," said Eric Allen, Business Development lead for the US based subsea and wells team. "Furthermore," he continued, "this is an area where digitalization can be coupled with existing processes to provide effective verification services resulting in high cost and safety benefits." 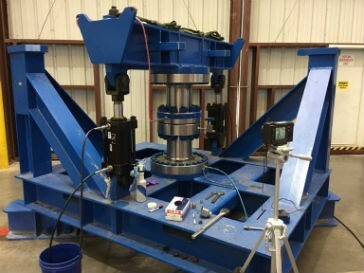 DNV GL's expert surveyors successfully tested the remote surveillance technology with Trendsetter Engineering Inc. (TEI) on the HPHT Subsea Capping Stack project. To do this, DNV GL developed specific protocols and optimized the camera and software interface ensuring that the remote surveyor can deliver the same level of quality as if he or she were on site. The initial pilot was a necessary step used to identify gaps and establish a solid foundation of protocols. The pilot clearly demonstrated that remote witnessing is an acceptable tool that delivers results for independent surveillance when suitable conditions are met. "The success of this pilot program improved efficiency and delivered cost savings," said Martha Viteri, Head of Section for DNV GL's US based Subsea and Wells team. "Working together with our industry partners we clearly recognized how this will change the future of surveillance." Third party surveillance costs can easily account for a significant portion of a verification project. With this new project execution model, DNV GL will deliver substantial cost savings and improved efficiency by eliminating travel and idle time. "Remote surveillance demonstrates DNV GL's commitment to drive innovation forward and deliver actual cost savings as well as value added activities, and faster results (for evidence and feedback) for the benefit of our Customers. In addition, this creates a safer way of working for surveyors," noted Martha. "We are happy to see that customers continue to positively receive this alternative and view this as a model for future inspection technologies." The camera and software system are fully operational and licensed by an independent provider.